Yip, yip….yowwww! Woooo…bark, bark…yip, yip…..yowwwwwowooooowwwww! Okay, my attempts at coyote cries are a dismal failure. Watch this or this. All the little hairs on the back of my neck were suddenly standing at attention. The calls were so close I could sense the fur and spit flying as a skirmish broke out amongst the band. Making it all the more eerie, Gus was sitting stock still and silent, his nose quivering slightly as he peered intently into the darkness. With the next coyote call, the old pregnant ewes hoisted themselves up from their sleeping spots and headed for the barn. That made me more than a little nervous. I realize there are those who feel that the nocturnal cries of the coyotes are some type of amazing natural music. That explains why they are called “the song dog”. And, I guess it’s cool that they have different calls to communicate. This is the most intense part of the shepherding year. Day-time, night-time…it seems I’m always headed toward the barn. And, there is a definite downside to spending a lot of time in the barn. 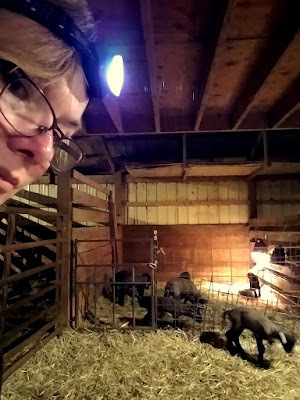 Not only do all my trips center around the barn, the welfare of the sheep and the potential sales hold my every thought captive. If I wake up in the middle of the night, I trudge out to make sure everyone is all right. Coyote cries just magnify my concerns. There are countless things that could put the entire operation in jeopardy. So, maybe it was starting the day before sun-up with the haunting sounds of the “song-dog” wailing and yipping in the neighbor’s field…maybe it was just a side-effect of the bronchitis meds, or a serious lack of sleep. Maybe it was a combination. But, when I found what appeared to be yet another single, tiny lamb, I kinda lost it. (okay, truthfully, I REALLY lost it) All the worries and uncertainties came crashing down…the sheep, the Market, our income stream (or lack thereof), the Boss’ health, the weather, garden plans, healthcare, insurance, the mess in government, future goals, past hurts and missed opportunities. How could any of this work? Did I even want to try? Some days this life that others think is such a dream is just so uncertain and seems incredibly hard. Just like the coyotes, the worries are always there. It’s just occasionally they seem to howl away, overwhelming and distressing. Since they certainly aren’t going away, we must learn to deal with them. The Boss’ advice is always…ask yourself what can you do about it? Find one thing and do it…and then, do the next thing…and just keep going. Therein lies the rub. It’s the times when I can’t think of a plan that I get so out of sorts. All those things over which I have no control send me into a tailspin. In this particular case, I could at least take care of the lamb. Then I could run some necessary errands and “do the next thing”. When I returned to the barn, the tiny, single lamb had been joined by two little sisters. TRIPLETS! That explained the size. (and got our lamb count back on track to some degree) Later in the day, more babies arrived. My ovine obstetric skills have yet to be needed this season. Hurray! With a plan in place to protect the sheep from the coyotes, it was time to head out for the Farmers’ Market annual meeting. This is when those who are interested in being Market vendors get together, go over the rules, reserve their places and pay their fees. Since the Boss is Market Manager, he heads up the meeting. I generally get pressed into service, although it must be pointed out that I have absolutely nothing to do with the running of the Market. We had a full house this year, even though a number of folks were absent. There were 15 new vendor applications! This will be the Market’s 25th anniversary. 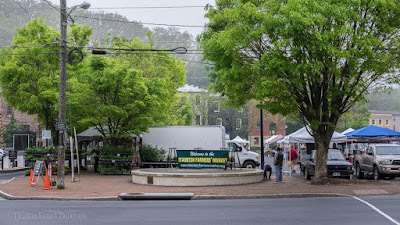 I wonder if those folks who founded the Staunton Farmers' Market ever thought that would be possible…? Things have certainly changed since the early days. And, more changes are scheduled. The City of Staunton is re-furbishing the parking garage across the street from the parking lot where the Market is held, so it will be closed for 6 months. That means that all the police vehicles will need to be parked elsewhere… (probably in the Market space) And, the job must be done during warm weather, so it will happen during the height of Market season. All of this will seriously impact the Market, in addition to the loss of customer parking. It remains to be seen how the customers will react to the disruption. I guess we will just have to wait and see how it all plays out. Uncertainty seems to be the watchword this year. That’s not to say there is nothing positive happening on the hill. Not at all. Broiler chicks have been ordered, lamb processing dates confirmed, and the Ag Census completed. We even had a 4H group come by for a farm visit the other evening! Lambs arrived all week with little or no fanfare. And, we spent Saturday evening with all the kids, celebrating my birthday. Thanks y'all...it was great! 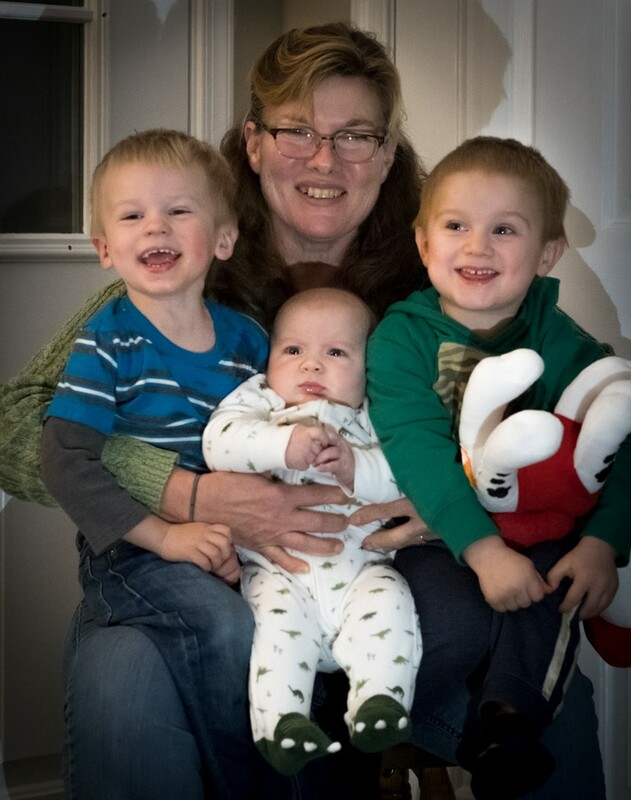 Nothing like snuggles with all the grandsons. When we got back, I headed to the barn to check on everyone. That’s when I heard an ewe screaming in pain. She was outside. It was beginning to rain. It was next to impossible to get her into the barn. And, all the other sheep were not being cooperative. However, she soon delivered without assistance and there are now 21 healthy lambs cavorting around the barn. afternoon at the "lamb beach"
Ah, the sun feels SO good! I wish there were more, but…it is what it is. There are two ewes that didn’t breed at the same time as the rest of the flock, so it is possible that there will be a few more next month. Although, even if that happens, we just won’t have the numbers we have in the past. We’re still feeling the effects of last year’s “challenges” to some degree. That’s frustrating in a number of ways. But, again…it is what it is. this little lamb has the most comfortable bed! Demand for lambchops (and all other cuts) has increased dramatically and it is tempting to consider expanding the operation. However, that’s much easier said than done. Housing, grazing and feeding throughout the winter would require some major adjustments as well as considerable financial investment. On the positive side, the lambs are all big and healthy. And, while I am supplementing a set of twins, (mama-sheep didn’t have enough milk) at least I don’t have SEVEN bottle babies like I did one year. Did you read this? or this? I guess that brings us to the end of the “news” from the hill. The upcoming week will find us watching the weather closely (we need precipitation!) and figuring out a time to haul a load of hay. it did NOT cause a fire! I haven’t heard the coyotes again. Happy birthday! I do so enjoy your weekly reports from the other side of the pond. As I was in farming too until my dear farmer died last March I know how up and down things can be - one minute all is well and then there is a glitch of some kind and things take a dip. Taking the rough with the smooth is something we learn to do isn't it? Hope the Boss.s health improves over the year. Hello Barb!! HAPPY BELATED BIRTHDAY! I too know about having my sheep and my herd getting bigger.. and bigger... and.. well - you get the picture! It is just too much now. I will be cutting a lot of it back this year due to my ongoing health issues and to the birth of my first grand-sons! There aren't enough hours in the day to just do it all and I am picking my priorities! God Bless You!! !